PHOTO BY JOSH SAUNDERS Amy Lechner stocks corn at Gentle's Farm Market, where the crop should be avilalable through October. As summer turns into fall, we're in the final stretch of fresh summer produce at area farmers markets. Rochester-area markets and farm stands by this time of the year are overflowing with seasonal fruits and vegetables of all colors, shapes, and sizes. The summer season is fleeting, though, and fall is in the air, so look for late-summer finds before autumn arrives and the farm stands start to clear out. Early September is prime harvest time for local farms, says Brighton Farmers Market Manager Sue Gardner Smith, noting that late summer is when many fruits and vegetables peak in flavor. 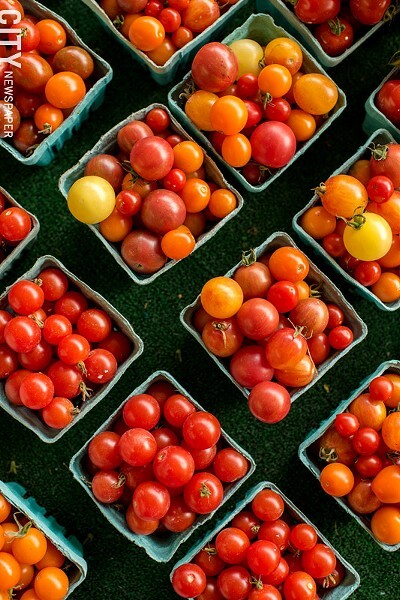 Among the dozens of vendors that gather in the Brighton High School parking lot (1150 Winton Road) every Sunday, tomatoes of every color and stripe are in abundance this time of year. Paul Loomis, of Growing Family Farms in Spencerport, is a regular vendor at the weekly market and grows heirloom varietals, such as Green Zebra, Pruden's Purple, and Pink Berkeley Tie-Dye — it has psychedelic pink and green stripes. Like many of the market's vendors, Loomis grows his crops with organic methods. He's a member of the Northeast Organic Farming Association and says he finds the organic farming community to be more open with their growing information than conventional farms. Jeremiah Pacheco of Squash Blossom Farm in Naples and another regular vendor at the Brighton market agrees. "There's no spirit of competition," he says. The excessive rain this year has caused blight and cracking in much of Pacheco's outdoor tomato crop, he says, but his indoor crop, grown in unheated tunnels, is doing well. His tomatoes include varietals like the super-sweet Sun Gold cherry tomato, which he says are excellent for snacking. He recommends keeping tomatoes at a cool room temperature, but never refrigerate them, as it dulls the flavor. The Brighton Farmers Market is open 9 a.m. to 1 p.m. on Sundays through November 19. 269-8918; brightonfarmersmarket.org. 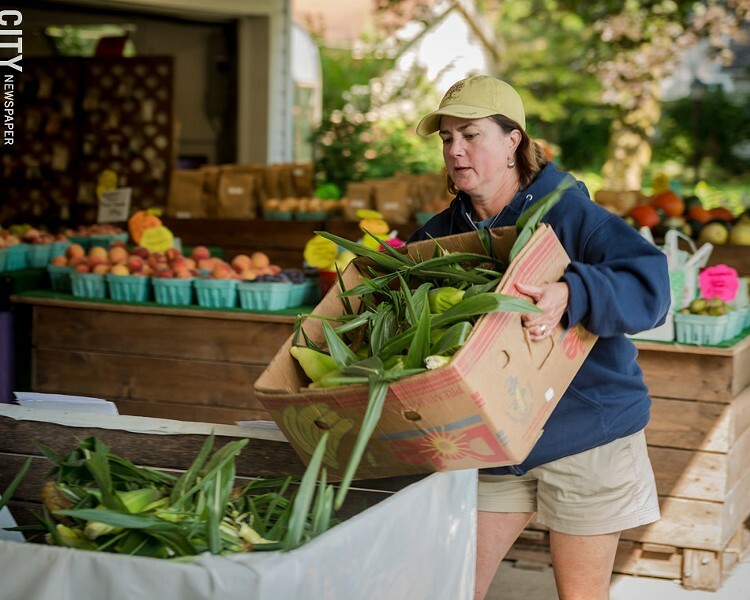 Sweet corn is king at Gentle's Farm Market (1080 Penfield Road) — that much is clear from the huge crate of freshly-picked ears sitting front and center near the entrance. Gentle's has been growing and selling sweet corns and other fruits and vegetables for more than 100 years. Originally owned by the Gentle family, the market closed briefly in 2015 before being purchased by the Lechner family, which also owns Clover Lawn and Landscape, and re-opened in 2016 under the same name and with an expanded inventory. This year's corn crop is still going strong, and corn should be available at Gentle's as late as October. For those uncertain about how best to cook corn on the cob, Gentle's recommends bringing a large pot of water to a boil, shutting it off right before adding the corn, and letting the ears sit for at least 10 minutes, up to 30 minutes. This method ensures the corn will reach a temperature of around 160 degrees and will have a texture that is snappy, not tough, every time. Gentles Farm Market is open daily from 9 a.m. to 6 p.m. 385-9843; gentlesfarm.com. At Lagoner Farms on Lake Road in Williamson, the apple crop is already starting to come in. First to arrive are Early Golds, which are best suited to baking, says Mark Lagoner, the farm's president. Next come the Ginger Golds and Paula Reds. The latter is similar to a McIntosh with its "mild, aromatic, and floral" notes, Lagoner says. By the time the orchards open to the public for picking the weekend after Labor Day, the farm expects McIntosh, Gala, and 20-ounce apples to be ready for harvest. Due to above-average rainfall this year, the apples being harvested from the farm are much bigger than usual, Lagoner says — last year's drought yielded apples that were small but high in sugars. This year it's quite the opposite: generously-sized fruits with a lower sugar concentration. In addition to popular, easily recognizable apples like Macs and Galas, Lagoner Farms also has about seven acres of heirloom apples, old cultivars not typically used in modern, large-scale agriculture. These apples, with names such as Cox Orange Pippin and Golden Russet, are used to make hard cider at Embark Craft Ciderworks, founded by the Lagoners in 2015. The Embark taproom directly adjoins the market, where fresh produce and baked goods are sold year round. Lagoner Farms is open daily from 9 a.m. to 5 p.m. at 6895 Lake Avenue, Williamson. Can't make the drive to Williamson? You can still buy Lagoner Farms produce at the Westside Farmers Market as well as at the farmers markets at Greece Ridge, Irondequoit, Fairport, and Brighton. 315-589-4899; lagonerfarms.com. Kirby's Farm Market keeps a handy produce calendar on its website listing the approximate time each of its crops is in season. This family-run market in Brockport (9739 West Ridge Road) has everything from A to Z — literally asparagus to zucchini — but late summer into October is prime time for plums. Kirby's plum varieties include red plums (which have a sweet fruit but tart skin), yellow (sweet, juicy, and crisp), and burgundy (mild with little tartness). Any of these varieties are good to eat out of hand, but also lend themselves well to stewing, roasting, poaching, and jam. In addition to plums, Kirby's is harvesting its first crop of elderberries — small, blue-black berries which are extremely high in antioxidants. Elderberries are tart when eaten raw, but have a more pleasant flavor when cooked in pies or boiled down into syrup. Kirby's Farm Market is currently open Monday through Saturday, 9 a.m. to 7 p.m., and Sunday, 10 a.m. to 5 p.m. Hours change in November and December. 637-2600; kirbysfm.com.